Shofner Vision Center receives LASIK inquiries from middle Tennesseans who are ready to ditch their glasses and contact lens. This year we decided to ask a handful of patients to express why they decided to get LASIK vision correction surgery and what made them choose Dr. Stewart Shofner. The responses were slightly varied but majority all had one common goal…TO IMPROVE THEIR VISION. What are some of the things you look forward to with your new eyes? “Yea, I do a lot of traveling, so to have one less thing to worry about as I travel is going to be amazing.” Mark continued, I am most excited about waking up in the morning, that first thing…to see the clock radio. I have bad eyes, without my glasses or contacts I can’t see a thing. To not have that dependency it really brings tears to my eyes. I can’t really fathom it. 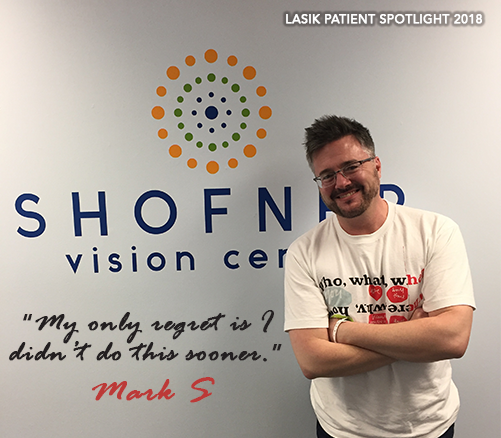 “My only regret is I didn’t do this sooner.” Mark S.
What is LASIK? Laser in situkeratomileusis, or LASIK, is an outpatient surgical procedure used to treat myopia (nearsightedness), hyperopia (farsightedness), and astigmatism. With LASIK, your ophthalmologist uses a laser to reshape the cornea to improve the way the eye focuses light onto the retina. While eyeglasses and contact lenses help improve your eyesight, there is no comparison to the freedom LASIK vision correction surgery provides. LASIK is safe, common, and effective. Many patients undergo this procedure each year, and most walk away with 20/20 vision - or even better. LASIK is an elective procedure, which means the choice to have it is yours. If you or a loved one struggles with glasses or contact lenses in order to see well, you may be asking yourself “Should I get LASIK?” Asking lots of questions is the best way to determine if it’s right for you. The staff at Shofner Vision Center can help answer your questions and concerns about laser vision correction surgery. It has been several months since Mark had LASIK vision correction surgery and his outcome was a huge success. He no longer has to worry about making sure he has all of his contact lens solutions packed while traveling, nor has to grab his glasses in order to see what time it is. Dr. Shofner has performed more than 40,000 LASIK vision correction surgeries, offers a free LASIK consultation/exam and special discounted pricing to all Military, Law Enforcement, Firefighters and EMTs. There is never any obligation and Dr. Shofner never pressures anyone to having surgery. See if LASIK is right for you and schedule a free consultation online or by calling (615) 340-4733.